We specialise in designing and delivering programs focused economic empowerment through financial literacy, entrepreneurship, business management training, micro-enterprise development, and more. Ngeay Ngeay is SHE’s Business Information, Consulting and Services arm. We provide professional business consulting, registration services, and links to trusted business service providers (such as legal, tax, etc.). In 2019, Ngeay Ngeay will be scaled up in partnership with Development Innovations to include a new eLearning platform for Cambodian entrepreneurs, as well as a re-designed website with updated information, tools, resources and service providers (launching July 2019). We work with partners around the country to help them design and deliver women’s economic empowerment programs, or providing consulting to organisations on subjects such as applying a gender lens to programming. We have worked with a variety of organisations to deliver workshops and programs including financial literacy, micro-enterprise development, business training, coaching, and more. Examples of such partners and projects can be found below. Contact us to find out how we can support your program design and delivery. We work with partners to conduct research into women’s economic empowerment and entrepreneurship in Cambodia. 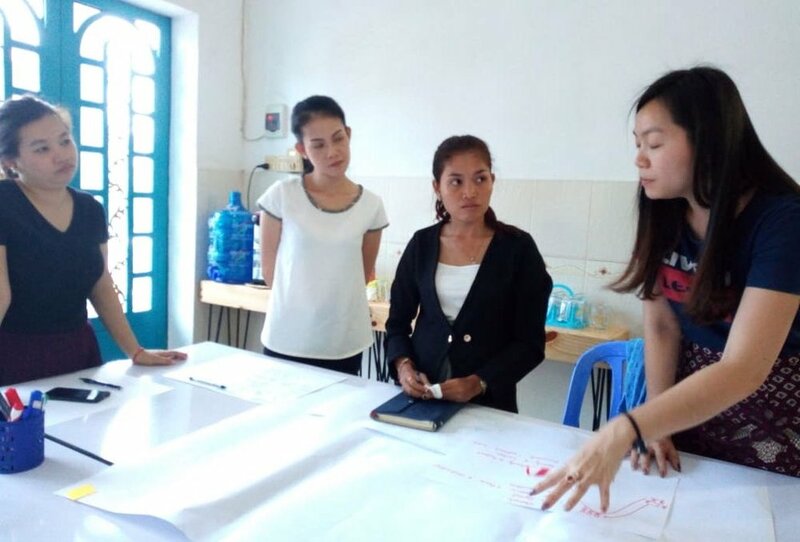 In 2018 we’re working with Pact Cambodia to conduct focus groups and surveys to understand the barriers and opportunities facing young women entrepreneurs, both as business owners and as contributors and participants in civil society. The results of this research are currently being reviewed, and will be made available online soon. Contact us if you’re interested in collaborating on research projects. We’ve worked organisations like Banteay Srei, KnK Cambodia and Cambodian Volunteers for Community Development to train their participants or staff in Financial Literacy for women's savings groups across multiple provinces in Cambodia. We’ve designed programs that has built on staff capacity in understanding effective financial management for households, working with savings groups to improve their effectiveness, and delivering basic financial literacy training for women with lower literacy and education levels. SHE Rescue Home provides shelter and care for young women who have been trafficked into prostitution or experienced gender-based violence. They also work with women and their families to help reintegrate them back into their homes, and support the families to increase their incomes through micro business loans. We trained their social workers in Basic Business Education, so they could work directly with women and their families to help increase the effectiveness of micro businesses. We taught them how to deliver training in financial literacy and for households and business, and how to start a sustainable micro business. We provide a specialised training program for Thriive Cambodia businesses, delivering a series of workshops to business owners on financial management, problem solving, goal setting, marketing, team management, and more. We also work closely with these businesses to provide them with individual support and mentoring to help their businesses grow and thrive, create new jobs, and deliver measurable social impact for communities. We’ve worked with iDE Cambodia, WaterSHED Cambodia and Engineers Without Borders Australia (Working in Cambodia) to design and deliver a tailored Women in WASH Incubator Program in Siem Reap, and a series of workshops for female sales agents and staff in Kampong Cham, to help improve business management and sales of WASH products (such as toilets and clean water filters) to rural communities.